This wooden wall planter box will add beautiful splashes of colour to your outdoors and garden. 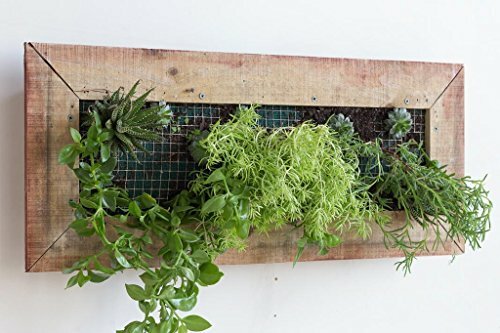 The wall planter is a decorative and space saving way to display succulents, herbs and flowers. It can be used to brighten up an outdoor wall or conceal an ugly space. The planter front is reinforced with 12mm (0.5") square galvanised wire mesh and has heavy duty nylon screen to hold the soil. The soil compartment is 70mm (2.75") deep for holding the potting mix. The back panel of the planter is a heavy galvanised sheet. The planter is fitted with two metal keyhole plates to the rear for mounting on a wall. The Wall Planter is handmade in Melbourne, Australia from treated pine which is suited to outdoor conditions and is long lasting. Over time the planter will weather and develop a lovely rustic patina which will add character to your wall. The planter is easy to use and simple to maintain. Planting instructions are provided with the wall planter. The back panel of the wall planter consists of a heavy galvanised sheet and has two metal keyhole hooks fixed to the panel for hanging the planter on a wall. The front is reinforced with a 12mm (0.5") square galvanised wire mesh and has a heavy duty nylon screen to hold the soil. The wall planter is handmade in Melbourne, Australia from treated pine to suit outdoor conditions and is fully assembled and ready for adding soil and plants.